emerging channel like Connected TV. You’re not alone; CTV and OTT are new experiences for all of us. For consumers, it’s a different way to watch television and movie content across many different types of screens – not just the big screen – with no cable or satellite subscription required. We have seen the recent release of YouTube TV and DirectTV Now to add to the existing major players like Hulu, Amazon Video, NETFLIX, Roku, etc. For advertisers, it’s an innovative way to reach a new, unique audience. Today’s viewers are increasingly turning to diverse viewing options that don’t necessarily involve a traditional TV set. 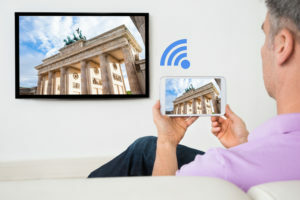 They’re watching on Smart TV’s, laptops, tablets, smartphones, game consoles and other connected devices such as Chromecasts, Amazon Fire TV Sticks, Roku and Apple TV. Linear TV is programming delivered in a standard, live, non-DVR’d manner. The standard way people have watched TV since 1948, when four television networks, (NBC, CBS, ABC, and DuMont), broadcasting over 128 stations, begin a full prime-time schedule 7 days a week. Smart TV – any television with a built-in internet connection and a media platform. This means that no additional devices or equipment is needed to stream on the TV. Some of the major players in the Smart TV space are LG, Samsung, Sony, and Vizio. Connected Device/Stick/Dongle – often referred to as OTT devices, these are boxes or dongles that plug directly into any TV set and to the internet, to enable apps and video streaming to be used on that television set, regardless of whether the TV itself is “smart.” Examples of these devices are Roku, Google Chromecast, Amazon Fire TV Stick and Apple TV. Gaming Consoles – Playstation, Xbox and Nintendo Switch are essentially acting as the connected device whereby they have built in app stores for streaming video and other content to your TV. “Over-The-Top” (OTT) is a reference to streaming TV content, because it’s circumventing traditional cable and satellite subscriptions to deliver video content. OTT content is watched through another device other than a television, like you smartphone, laptop, desktop or tablet. If you are using a device like a Chromecast or Amazon Fire Stick to stream video content from your smartphone, laptop or tablet to your television, then this is considered OTT. What is CTV in advertising? CTV is short form, skippable online advertising targeted to relevant content channels and/or audience groups. Connected TV (CTV) refers to any TV that can be connected to the internet and access content beyond what is available via the normal offering from a cable provider. It also refers to devices that use a television as a display and can connect to the internet to access content. What actually constitutes Connected TV content? CTV inventory is premium, professionally produced television content. It’s not the banner display ads that sometimes appear on CTV devices. What are the benefits of CTV Advertising? 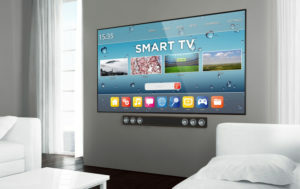 With connected TV advertising, you can reach TV viewers that advertisers can’t reach without traditional TV commercials. That’s where Connected TC (CTV) comes in. Superior Targeting Capabilities: With Connected TV audience targeting, you can be sure your marketing dollars are going towards your most valuable and targeted viewers. Measurable Results: Our programmatic platform lets you measure the results of your Connected TV campaigns with both digital and traditional metrics, including video completion rates (Plus, see the end-to-end customer journey from viewing a TV commercial to making the purchase. What is OTT in advertising? OTT TV originally focused on content delivery over the internet through Netflix, Hulu and Amazon, but now, there are literally hundreds of streaming services that cater to individual niches, like episode content, short form content like local news or how-to tutorials, live streaming, video on demand and liner television. As viewers of all ages turn to OTT services, marketers are discovering new opportunities to target and align with key audiences. Advertisers can now pinpoint specific audiences with strategic brand messages. What are the benefits of OTT Advertising? Brand Safety with ads delivered during live TV or On demand, viewers are reached across top tier networks and popular content. 100% view-ability – All ads run full screen so 100% of pixels are in view, eliminating below the fold ads of other media vehicles. Near Perfect Ad Completion – Viewers are watching the ads all the way through, with an average completion rate of 98%. You can retarget your OTT & CTV viewers across all their devices, including laptops, tablets, and mobile phones. Keeping your message top-of-mind throughout the decision-making process. Gross Rating Point (GRP) – GRP is used to determine how many people within your target audience saw the ad. The simplest was to break it down is GRP = Reach% x Avg. Frequency x 100. So if you reach 30% of your target audience with your ads at a frequency of 4 ads each, then your GRP is 120. Cost Per Point (CPP) – a quick way to measure how well, for the price, your ads reach your desired audience. This is figured by taking you total media cost divided by your GRP. With OTT & CTV advertising, you can reach TV viewers that advertisers can’t reach with traditional linear TV commercials. The rise of OTT & CTV viewership is creating new ways for advertisers to reach their target audiences by combining the impact of TV with the precision of digital. With OTT & CTV advertising through The Xcite Group, advertisers can now target, measure, and retarget TV-viewing households. It’s still television. But now, it’s more than you’ve ever imagined.